On this Giving Tuesday, we spotlight the XPRIZE – the global leader in designing and implementing innovative competition models to solve the world’s grandest challenges. The Celestis Foundation was one of the earliest donors to the XPRIZE — well before $10 million was raised to award the winner of the Ansari XPRIZE. The XPRIZE, later titled the Ansari XPRIZE for suborbital spaceflight, motivated 26 teams from seven nations to invest more than $100 million in pursuit of the $10 million purse. 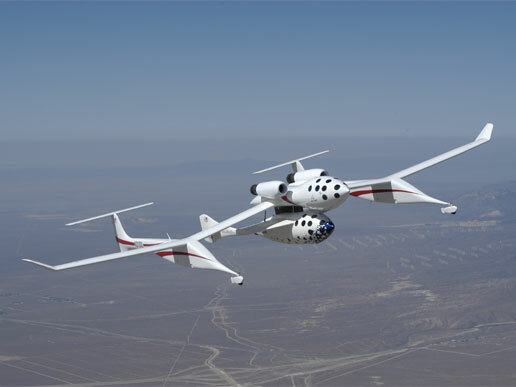 On October 4, 2004, the Ansari XPRIZE was awarded to Mojave Aerospace Ventures for its successful flights of SpaceShipOne, marking the dawn of the personal spaceflight revolution and signifying a radical breakthrough in prize philanthropy. The original XPRIZE was announced in 1996, offering a $10 million prize to the first privately financed team that could build and fly a three‐passenger vehicle 100 kilometers into space twice within two weeks. 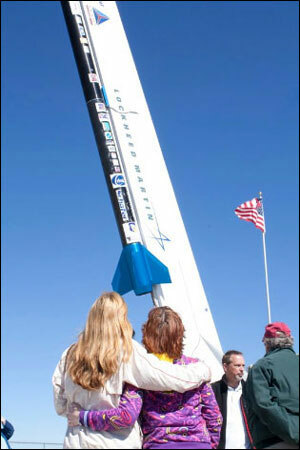 In 1997 Celestis hosted a Texas XPRIZE event at the Lone Star Flight Museum in Galveston, Texas. Our event featured a presentation by Erik Lindbergh (grandson of Charles Lindbergh). 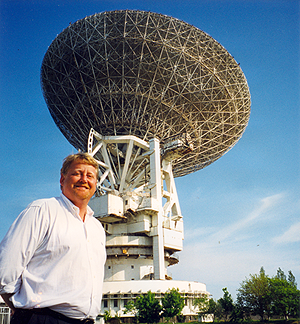 Celestis CEO Charles Chafer served on the XPRIZE’s earliest Advisory Board. 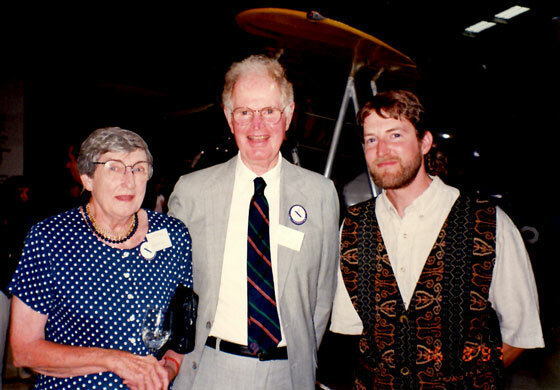 Catherine and David Hannah, Jr., founder of Space Services Inc. of America, with Erik Lindbergh (right) at the 1997 Texas XPRIZE event at the Lone Star Flight Museum. The Celestis Foundation shares your dedication to promoting innovative projects that improve life on Earth and stimulate our ongoing exploration of the universe. When you select a Celestis Memorial Spaceflight for a loved one or yourself, you are also making a real contribution to a positive, sustainable human future. A portion of the proceeds from each Memorial Spaceflight mission is donated to individuals, institutions, and organizations — such as XPRIZE — that embody the spirit and commitment of mission participants. XPRIZE Founder and Executive Chairman Peter H. Diamonds, M.D. 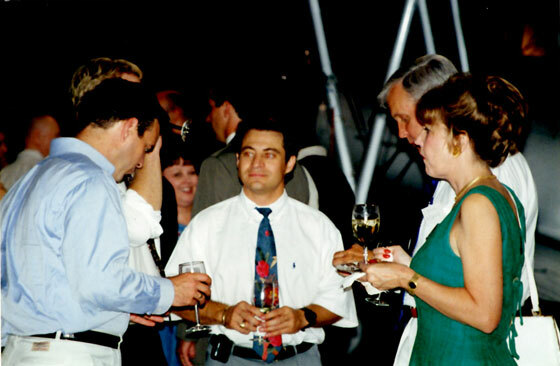 (center) at the 1997 Texas XPRIZE event at the Lone Star Flight Museum. The Celestis Foundation ensures a continuing source of support for the people and projects that will accelerate the opening of the space frontier and the preservation of Earth. Learn more about the Celestis Foundation. Many British families have chosen Celestis funeral flights to commemorate the lives of their departed loved ones. Celestis encourages Britons interested in our unique space funeral services to work with Heavens Above Fireworks, which is our master distributor in the United Kingdom. 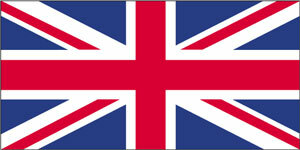 The company is led by Mr. Fergus Jamieson of Epping, Essex. Heavens Above Fireworks offers customers fireworks displays that incorporate cremation ashes. Their goal is to create a happier memorable event rather than a traditional funeral memorial. 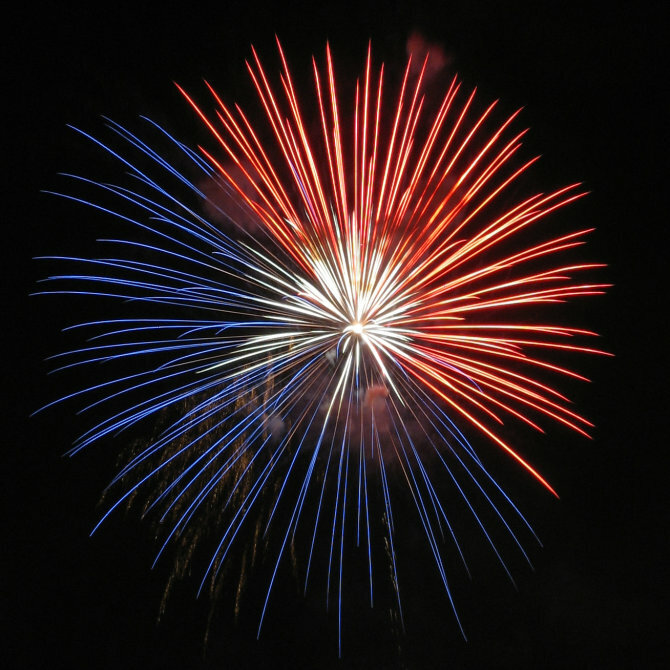 Firework displays often happen several weeks or even months after the traditional funeral ceremony, after the initial grieving period, and offer the family a chance to come together to truly celebrate the life of their loved one. Having such an excellent distributor in the UK helps Celestis reach a wider audience who might not have otherwise heard of us. It also allows clients in the UK to have a British contact who can address questions and concerns during the decision making process. Mr. Jamieson has also been so kind as to prominently feature Celestis on his own website. Two brothers (actors Dimitri Leonidas and Sean Biggerstaff) discuss the impending liftoff of their father’s ashes in Boldly Gone. A new short feature – Boldly Gone – produced by London indie studio x and directed by Mark Buchanan, tells the story of two estranged brothers reunited as they attempt to launch their father’s ashes on a home built rocket into low earth orbit – from a field on England’s stunning North Norfolk Coast. Starring Sean Biggerstaff (Harry Potter and the Philosopher’s Stone) and Dimitri Leonidas (Monuments Men, Rosewater) with a cameo by legendary Buck Rogers actor Gil Gerard, the film blends all of the elements of a Celestis launch – grief, anticipation, exhilaration, closure, and joy – with the human story of two brothers rediscovering their own relationship. Boldly Gone from xFilm on Vimeo. Released to the public on February 3, 2016, the film has been advance showing at various festivals – including Texas’ own SXSW – for over a year. This isn’t the first time the topic of space funerals has made it to the movies. 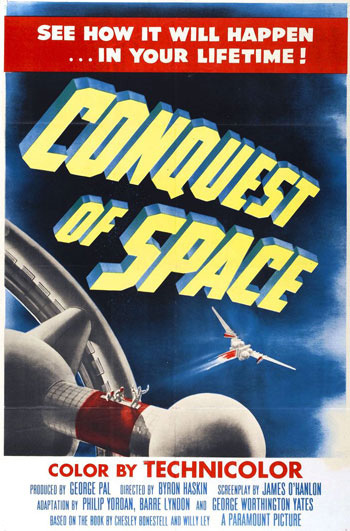 Science fiction movies like George Pal’s Conquest of Space (1955), or Star Trek: The Wrath of Khan (1982) portrayed funerals and memorial services in space. The Loved One, 1965’s satirical portrait of the California funeral industry of the 60s, included a space funeral. It wasn’t until after the Celestis Founders Flight in 1997 that popular culture, including films, began to portray the reality of burial in space. 2001’s global hit Amelie included a mention of burial in space as something the character wanted to do. 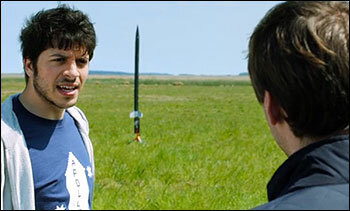 In 2008’s I Know You Know, Welsh film maker Justin Kerrigan included as the final scene actual footage of the Celestis Ad Astra Flight on which his father was a participant. Kerrigan has won numerous international awards, including the British Academy of Film and Television Arts Best Director award for 2000’s Human Traffic. Even as more and more elements of our culture explore the notion of memorial spaceflights in art, song, film, and literature, it is unlikely that Boldly Gone will be eclipsed in its simple meaning and elegant story telling. Charles M. Chafer, CEO, Celestis, Inc. These questions – coming from people who are considering or have already purchased our space funeral service – are completely understandable. The Celestis Memorial Spaceflight service is a compelling and special way to celebrate a life – by launching a symbolic portion of cremated remains or DNA sample into space, into Earth orbit, to the Moon, or into deepest space. Because it is such a compelling service its anticipation can be a bit overwhelming, when juxtaposed against the reality of the challenges of actually achieving space travel. The notion of a final memorial space journey has been with us at least since the dawn of the Space Age, and I’ve even traced the concept back to the 1930’s era of “pulp fiction” science fiction novellas. The very first space burial was conducted by NASA in 1992 when astronaut James Weatherbee carried a symbolic portion of Star Trek creator Gene Roddenberry’s ashes aboard Space Shuttle Columbia STS – 52. But it wasn’t until Celestis conducted its first mission – the Founders Flight in 1997, which also included Mr. Roddenberry as a participant – that the option of launching ashes into space as a final tribute became a reality for all of us. Since 1997, we’ve conducted 14 memorial spaceflight missions. No other company has successfully completed even one – some have tried. We’ve (symbolically) sent more people into space than all Earth’s nations combined have sent astronauts, cosmonauts, taikonauts (Chinese astronauts), and tourists. We’ve been able to achieve this impressive record despite the fact that – even after 55 years of spaceflight – space launch events are rare, expensive, and remain difficult to successfully accomplish. There are only approximately 45 global commercial space launches conducted PER YEAR, with only a small (but increasing) percentage of those hosting commercial secondary payloads, including Celestis. Most commercial space missions involve satellites valued in excess of $100m and require the full capability of the rocket to ensure proper orbital placement, leaving no opportunity for secondary payloads. By comparison, note that globally there are more than 100,000 commercial air flights EVERY DAY, with plenty of available cargo capacity. Celestis has negotiated flights with proven providers of space launch services including Orbital/ATK, SpaceX, NASA, and UP Aerospace. We are one of the very first companies to contract with launch companies for small, “ride along” payloads, and we continue to find innovative ways for our participants to fulfill their final wish for a memorial spaceflight. We’ve proven again and again that we understand the complexities of providing flight ready secondary payloads without disruption to the primary mission – a matter of paramount importance to our hosts. As we consider which flight opportunities to pursue on behalf of our clients we assess three factors prior to proceeding to contract negotiations with a space mission provider. Each is important, and each requires the kind of expertise we’ve gained over 35+ years of commercial space operations – remember Celestis’ parent company Space Services launched the first-ever private rocket into outer space in 1982. When we select a mission provider, you can be assured that we have made a careful choice on your behalf. 1. Affordability – The only way memorial spaceflights can remain within the reach of the average person (our Earth Rise and Earth Orbit services are priced at less than the average cost of a US funeral) is by purchasing secondary space on a rocket or spacecraft. Very few of us could afford to buy an entire rocket for ourselves! 2. Reliability – This is a key consideration. We want to give our participants the best possible chance of success on their memorial spaceflight mission. As the commercial space industry blossoms and new entrants begin to offer new launch and mission services, we are encouraged that very soon commercial secondary payloads such as Celestis will enter an era of abundant availability. But we are not there yet. Moreover, as new entrants emerge there is always a “proving” period during which systems are not yet fully mature and are subject to an elevated level of development delays and even inflight failures. 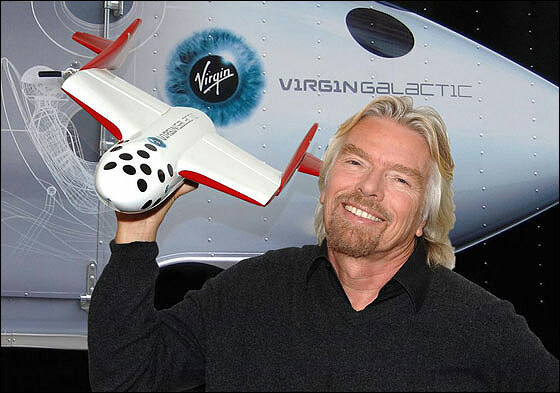 For example, in 2003 Virgin Galactic – the “space tourism” company founded by Sir Richard Branson – announced their initial flight scheduled for 2007. In 2016 that first mission is still at least two years away, with over 700 customers waiting for one of six seats per flight once the SpaceShip 2 system is declared operational. This is not an atypical development cycle in aerospace. I should also note that as a rule Celestis will not place one of our spacecraft on the first mission of a new launch vehicle conducted by a new launch team. We have witnessed two instances of companies that were seeking to compete with Celestis placing their payload of precious remains aboard the first flight of a new rocket – in both instances the flights failed. While missions can always fail for a variety of reasons, we believe that first missions are subject to a higher failure rate than missions employing a proven launcher and/or team – hence our avoidance of first flights. 3. Launch Location and Scheduling – As I mentioned – and as everyone who has attended one knows – Celestis launch events are perhaps the most compelling memorial services on (or off!) the planet. Many families and friends travel from all over the globe to be at the launch of their loved one into space. We’ve launched from all over the world, but our most popular missions fly from one of three US launch sites, so we tend to favor those launch sites. 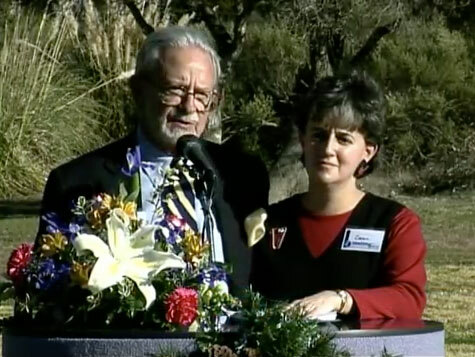 A family praises the Celestis team at a Celestis memorial service. View video of their testimonial. Often our contract negotiations with mission providers, which often involve multiple departments within very large aerospace companies, are governed by very strict Non Disclosure Agreements (NDA’s). For a variety of valid reasons these service providers desire to tightly control the public release of information about their partnerships and customers. We understand these reasons and abide by all of the provisions of any NDA we sign – even including, on rare occasions, silence right up to the launch itself. Of course, in these extreme instances we use private means of communication to keep the family members and friends of our participants informed. Once we’ve reached agreement with a launch services provider to host a Celestis payload, the next step in getting to a launch is called “manifesting,” which means committing the Celestis payload to a specific launch or spacecraft. 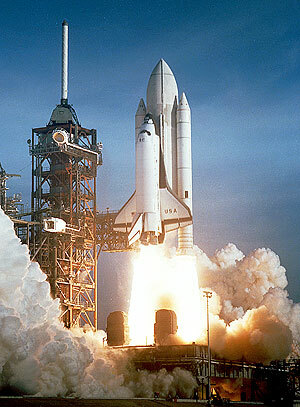 The majority of NASA space shuttle missions experienced launch delays. When a Celestis launch is manifested and scheduled, and the Celestis payload is integrated onto the rocket or spacecraft, the countdown to launch commences. For some of our missions – especially the Earth Rise Service – the count is smooth, the launch date predictable, and there is overall relative schedule certainty. For others – for a variety of reasons – the schedule is much less predictable. Again, this is not uncommon in the space business. For example, NASA’s Space Shuttle – one of the most expensive launch vehicles ever developed – launched on schedule about 40 percent of the time. A 2008 analysis by the Associated Press found that of the 118 Shuttle flights that had flown at the time, only 47 lifted off on time. So even with the best technology NASA can generate, launch schedules in the modern era are at best estimates of projected launch dates. All of this may seem rather daunting, but it shouldn’t be. Memorial spaceflights are meant as celebrations, achievements, and the fulfillment of dreams. Who can put a schedule on reaching these amazing goals? Part of the reason the waiting is so difficult is that the reward is so special. The first president of Space Services, astronaut Deke Slayton, was originally scheduled to be on the second Mercury orbital flight in 1962. Deke was grounded by a heart murmur and had to wait 13 years and visit countless doctors before he was able to launch into space aboard Apollo-Soyuz in 1975 – it was that important to him. Fortunately, no one has had to or ever will wait that long for a memorial spaceflight. The current incredible growth of commercial space activities guarantees that more and more, the choice to commemorate someone’s life with a memorial spaceflight is an achievable goal. With Celestis, one can be assured that even though we are still in the “Wright Brothers era” of commercial spaceflight, we will continue to offer our uniquely compelling memorial service through an ever increasing number of providers, offering ever more choices for people all over the world. What is more appropriate as we become a multi-planet species than to take our rituals, memorials, and remembrance practices along with us? Celestis is the pioneer, but the families of Celestis participants – often patiently waiting for the next flight – are the real reason why we are able to offer this most compelling memorial service. That’s the reason we keep each family fully informed of the latest launch news, take the time to answer each family’s questions, and provide families a truly memorable launch experience — whether they attend the launch and related activities in person or online. In short, our mission is to help families fulfill their departed loved ones’ dreams of spaceflight. While launch schedules may change, in the end making spaceflight dreams come true is what our service is all about. 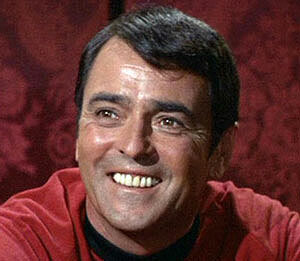 This photo of Celestis participant James Doohan (Star Trek‘s “Mr. Scott”) is part of the permanent Celestis display at the National Museum of Funeral History. Celestis is part of a permanent exhibit at the National Museum of Funeral History, which is located in Houston, Texas. The exhibit honors Celestis and some of the past notable figures Celestis has flown into space, including Mercury 7 Astronaut L. Gordon Cooper, Star Trek creator Gene Rodenberry and Star Trek actor James Doohan who played “Mr. Scott.” On display are pictures and replicas of the flight containers that carried these celebrities’ cremated remains in space, engraved with their names and flight messages. The Celestis exhibit provides an overview of our memorial spaceflight services and features a model of the SpaceLoft XL launch vehicle, built and flown by UP Aerospace, that flies our Earth Rise Service missions into space from Spaceport America, New Mexico. 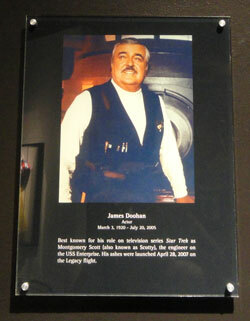 The museum decided to honor Celestis as we are the only private company to have conducted memorial spaceflights. Called “Thanks for the Memories,” the exhibit honors not only Celestis, but also iconic figures in history such as Michael Jackson, Marilyn Monroe and Jacqueline Kennedy Onassis. “Thanks for the Memories” is dedicated to capturing and highlighting the magnificent and interesting ways society has bid farewell to some of the world’s most famous figures. 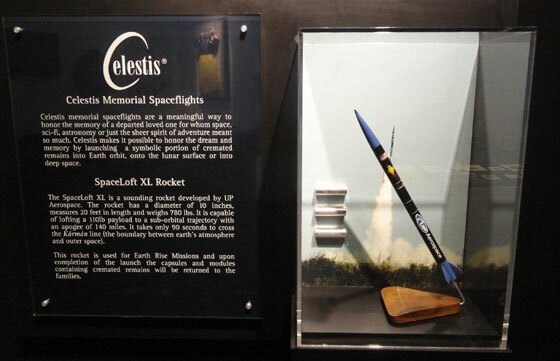 Part of the Celestis display at the National Museum of Funeral History, which chose Celestis as the only company that has conducted memorial spaceflights. Shown here are a model of the UP Aerospace’s SpaceLoft XL launch vehicle, a photo of a Celesits launch from Spaceport America, and replicas of the Celestis flight modules that have flown the cremated remains of Gene Roddenberry, James Doohan and L. Gordon Cooper into space. Being the only private company to have conducted memorial spaceflights — with over 1,000 participants flown so far — Celestis is widely known for its unique service for honoring departed loved ones. As a result, Celestis has often been featured in popular culture. Celestis gained worldwide notice with its very first memorial spaceflight — The Founders Flight, which was launched into space in April 1997. Major media outlets around the world covered the story. See, for example, the New York Times‘ front page article. The New Yorker magazine published a cartoon about the launch. Pop culture icon Timothy Leary, Star Trek creator Gene Roddenberry and 22 others were on board this mission. The flight was recorded in the Guinness Book of World Records, and was even added to the popular board game Trivial Pursuit. With the many Celestis missions flown since the Founders Flight, Celestis has gained high profile endorsements over the years. Noted personalities from U.S. 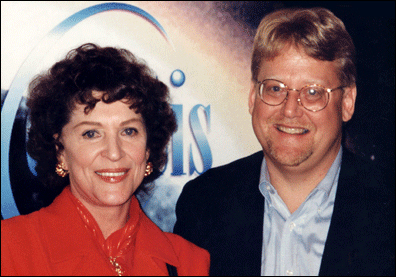 Senator John Glenn to actress Susan Sarandon have recommended Celestis to friends and constituents. Actors including Jonathan Frakes, Patrick Stewart, and Tom Hanks have announced their own interest in a space funeral. Star Trek actor James Doohan has flown on three Celestis missions, and will be on a future Celestis Voyager Service mission into deep space. Joining him on that mission will be Star Trek‘s Gene and Majel Roddenberry. 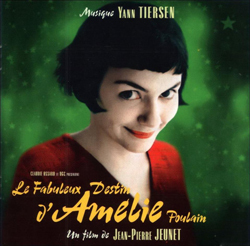 Movies, including the award winning French film Amelie, have made references to the Celestis Memorial Spaceflight service. Popular music from country and western to electronica has been composed and released highlighting the Celestis service. Our CEO, Charles Chafer, even appeared on the popular game show To Tell the Truth. But you don’t have to be a celebrity to use the Celestis service. The overwhelming majority of Celestis memorial spaceflight participants were everyday people who typically had an interest in space exploration, science fiction, astronomy … or just lived life to the fullest! For more information about arranging a memorial spaceflight for yourself or a loved one, contact us today. Protected: How can I memorialize my loved one as a shooting star? Can I prearrange a space funeral? Prearranging a funeral is a smart choice. You ensure that your wishes will be honored. Prearrangment also relieves your family of anguishing over what would be the most appropriate way to honor your life. With a preneed space funeral contract you lock in the price of your space burial: You need not worry about future price increases. What’s more, it’s simple to arrange. 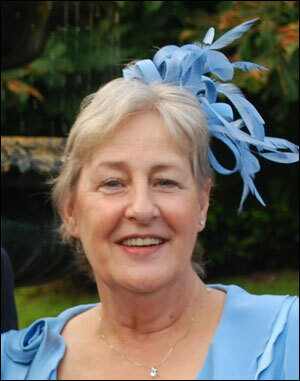 Prearranged funerals and memorial services are an increasingly popular option. With Celestis, you can arrange to have your cremated remains launched into Earth orbit, to the Moon, or into deep space. Celestis can even fly your ashes into space and parachute them back to Earth: Your cremated remains will be returned to your family, still encapsulated in the spaceflight hardware that flew in space. Celestis provides a preneed contract for each of its space burial services. You can download the contract from the Celestis website. Carefully review the contract with your family: This is a good way to ensure your family will clearly know your wishes when the time comes. 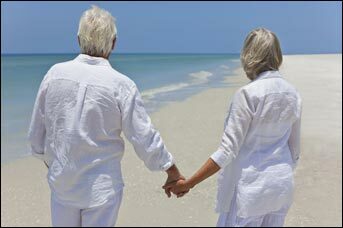 You might also want to express your wishes for final disposition in your will. A 10-20% deposit locks in the price of the memorial spaceflight service you choose. You can make periodic payments toward the balance of the contract, use insurance to pay for the balance of the service, or your estate can pay the balance owed at the time of need. Celestis offers a 10% discount for veterans. You can cancel at any time. Your money is deposited into a Trust account with the Houston branch of ClearPoint Federal Bank & Trust. This account is audited annually. In fact, Celestis received the highest ranking from the Texas Department of Banking, which audited Celestis’ preneed account on April 7, 2014. Finally, consider attending a Celestis memorial spaceflight launch! Celestis launches from a variety of locations. Bring your family and friends and experience the excitement of liftoff! For more information, contact Celestis at celestis.com/contact.asp. Author CelestisPosted on May 1, 2014 May 1, 2014 Categories General InformationLeave a comment on Can I prearrange a space funeral? The Goddard Flight, Celestis’ tenth memorial spaceflight, was named in honor of Dr. Robert Hutchings Goddard, who is considered to be the father of modern rocket propulsion, and who conducted much of his pioneering research near Roswell, New Mexico. A physicist of great insight, Goddard also had a unique genius for invention. Given Celestis’ innovative use of rocket technology to launch cremated remains into space from Spaceport America, it is only fitting that we paid tribute to this aerospace pioneer and longtime New Mexico resident. Born October 5, 1882 in Worcester, Massachusetts, Goddard developed his interest in space and astronomy at an early age, inspired in part by H.G. Wells’ sci-fi classic, War of the Worlds, and by his parents, who provided young Robert a telescope and otherwise encouraged him to pursue a scientific career. Goddard studied at Worcester Polytechnic Institute and Clark University, earning his Ph.D. in 1911. In 1914, Goddard received two U.S. patents. One was for a rocket using liquid fuel. The other was for a two or three stage rocket using solid fuel. Note that The Goddard Flight carried the ashes of Earth Rise service participants into space on board a solid fuel rocket. At his own expense, Goddard began to make systematic studies about propulsion provided by various types of gunpowder. His classic document was a study he wrote in 1916 requesting funds from the Smithsonian Institution so that he could continue his research. This was later published along with his subsequent research in a famous January 1920 report to the Smithsonian Institution entitled “A Method of Reaching Extreme Altitudes.” In this treatise, Goddard detailed his search for methods of raising weather recording instruments higher than sounding balloons. In this search, he developed the mathematical theories of rocket propulsion. Dr. Robert Goddard and his liquid oxygen-gasoline rocket in the frame from which it was fired on March 16, 1926, at Auburn, Mass. 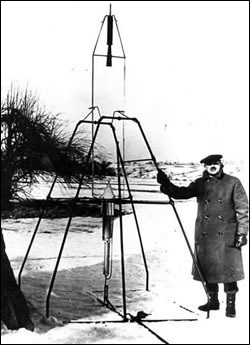 By 1926, Goddard had constructed and successfully launched the first rocket using liquid fuel. Indeed, the flight of Goddard’s rocket on March 16, 1926, at Auburn, Massachusetts was as significant to history as that of the Wright brothers at Kitty Hawk. Goddard’s greatest engineering contributions were made during his work in the 1920s and 1930s. He received a total of $10,000 from the Smithsonian by 1927, and through the personal efforts of famed American aviator Charles A. Lindbergh, he subsequently received financial support from the Daniel and Florence Guggenheim Foundation, which financed his research in New Mexico. 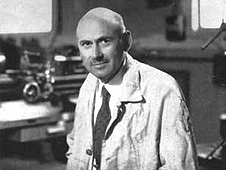 Goddard spent a dozen years near Roswell, New Mexico with the support of the Guggenheim Foundation, further developing and testing his rocket designs. While Goddard’s rocket work made little impression on American government officials of the 1920s and 1930s, German rocket scientists paid close attention: Goddard’s research largely anticipated in technical detail the later German V-2 missiles, including gyroscopic control, steering by means of vanes in the jet stream of the rocket motor, gimbal-steering, power-driven fuel pumps and other devices. Indeed, Goddard inspected several captured V-2’s in 1945, confirming that the Germans had used his designs. Goddard died later that same year from throat cancer. Developed and demonstrated the basic idea of the “bazooka” two days before the Armistice in 1918 at the Aberdeen Proving Ground in Maryland. NASA’s Goddard Space Flight Center in Greenbelt, Maryland, the Goddard Crater (located on the Moon’s eastern limb) and The Goddard Flight are all named in honor of this hero of space history.